I recently introduced the concept of semi-parliamentary government as part of a comprehensive typology of democratic forms of government 1 (Ganghof 2018). The typology sees “semi-parliamentary government” as one of six basic ways to structure the principal-agent relationship in a democracy (Table 1). It exists when the legislature is divided into two parts, both of which are directly elected, but only one of which has the constitutional right to dismiss the cabinet in a vote of no-confidence. The typological innovation had three related goals: (1) to apply the existing typological approach more consistently, (2) to highlight semi-parliamentary systems as a neglected form and (3) to theorize new semi-parliamentary designs as reform options in democratic nation-states as well as the European Union. Here I will focus on the first goal. One worry raised by Robert Elgie (2018, blog post) is that my approach has too many classificatory clauses or dimensions. Yet we must not conflate two separate issues. One is whether we should include criteria other than the origin and the survival of the executive, in particular the rules of assembly dissolution. As I never proposed this (see Table 1), there is no disagreement here and no need for adjectives like “semi-fixed”. The real disagreement concerns what the consistent application of the established criteria requires (Ganghof et al. 2018b). Robert maintains in his post that “[i]f we stick to the separate origin and survival of the executive and legislature, we get the three standard categories (presidentialism, semi-presidentialism and parliamentarism).” I think this statement is incorrect and that it shows the predicament of the existing approach. To see this, let us first ignore the internal divisions within both the executive and legislature. The focus on the origin and survival then gives us a four-fold table (consisting of the two outer columns in Table 1). It distinguishes pure parliamentarism and pure presidentialism from the two “mirror hybrids” that exist in Switzerland (assembly-selected fixed-term cabinet) and existed in Israel (directly-elected but assembly-dependent prime minister). In this elegant and consistent typology neither semi-presidentialism nor semi-parliamentarism are distinct types; both are merely sub-types of parliamentarism. 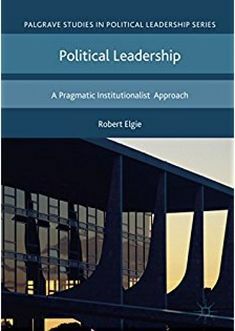 To delineate semi-presidentialism as a distinct type, as Robert wants to do, he has to make a further distinction between “single” and “dual” executives in otherwise parliamentary systems. Indeed, other leading scholars like Samuels and Shugart (2010: 27) first distinguish between systems with single and dual executives and then use the fourfold table to subdivide the single-executive systems. This two-step classification procedure is straightforward, but also somewhat ad hoc and inconsistent. For if we introduce the internal division of the executive into the typology or classification, we ought to do the same for the legislature. After all, just as only one part of the executive may be dependent on assembly confidence, only one part of the legislature may be required to supply it. There is a logical symmetry here that existing classifications neglect. Their asymmetric focus on the internal division of the executive would at least have to be justified, but I am not aware of any such justification. The same asymmetry and inconsistency shows when we consider the criterion used to distinguish semi-presidential from parliamentary systems. The criterion is the direct election of the president. This criterion is usually not justified explicitly and, again, not applied consistently. If direct election is used as a criterion for an agent’s sufficient democratic legitimacy – for being a primary rather than subsidiary agent of voters – then it ought to be applied to the legislature as well. This is what my typology and the concept of semi-parliamentarism do. They systematically consider the role that direct election plays in constituting a typologically relevant internal division within executive and legislature. In sum, I contend that the proposed typology results from a symmetric application of long-established criteria. In contrast to Robert, I think it is inconsistent to treat semi-presidentialism and semi-parliamentarism differently. Either both are sub-types of parliamentarism or both are distinct types. The two forms of hybridization can also be combined, as is the case in the Czech Republic, but there is no logical reason to see the semi-presidential characteristic of this case as being conceptually prior to its semi-parliamentary characteristic. The other goal, and the most important one for me, is to guide our thinking towards new semi-parliamentary designs as reform options for democracies, not only but especially for presidential systems (Ganghof 2016, 2018). In my view, this heuristic function is an important purpose of typologies. And if this is the purpose, the number of democracies that fall into each category is quite irrelevant. The current empirical predominance of democracies with directly (or at least popularly) elected presidents certainly tells us nothing about their normative justifiability. A crucial insight of the analysis of semi-parliamentary constitutions is that they can potentially reap all the alleged benefits of presidential systems highlighted in the political science literature – constitutional separation of powers, pre-electoral identifiability, post-electoral clarity of responsibility, cabinet stability, a single system-wide constituency, and issue-specific coalition building in the legislature – but without the cost of concentrating massive executive power in a single human being and thereby “presidentializing” political parties (Samuels and Shugart 2010). This raises deep and thorny questions about the democratic justifiability of presidentialism. As Josep Colomer (2013) and others have reminded us, presidentialism has deep monarchical roots. Maybe it is time for us to think about how we can separate what is good about presidentialism from what is dangerous for the quality and survival of democracy. The analysis of semi-parliamentarism would not be a bad place to start. Colomer, Josep M. 2013. “Elected Kings with the Name of Presidents. On the origins of presidentialism in the United States and Latin America.” Revista Lationamericana de Politica Comparada 7:79-97. Ganghof, Steffen. 2016. “Combining proportional and majoritarian democracy: An institutional design proposal.” Research & Politics 3 (3):1-7. ———. 2018. “A new political system model: Semi-parliamentary government.” European Journal of Political Research (57):261-81. Ganghof, Steffen, Sebastian Eppner, and Alexander Pörschke. 2018a. “Australian Bicameralism as Semi-Parliamentarism: Patterns of Majority Formation in 29 Democracies.” Australian Journal of Political Science 53 (2):211-33. ———. 2018b. “Semi-parliamentary government in perspective: concepts, values, and designs.” Australian Journal of Political Science 53 (2):264–9. Samuels, David, and Matthew Shugart. 2010. Presidents, Parties, and Prime Ministers – How the Separation of Powers Affects Party Organization and Behavior. Cambridge: Cambridge University Press. Taflaga, Marija. 2018. “What’s in a name? Semi-parliamentarism and Australian Commonwealth executive-legislative relations.” Australian Journal of Political Science 53 (2):248-55. This entry was posted in Presidentialism, Presidentialism and parliamentarism, Semi-presidentialism and tagged presidentialism, semi-parliamentarism, semi-presidentialism on May 16, 2018 by Robert Elgie. This is a guest post by Paul Chaisty and Timothy J. Power. It is based on their paper ‘Flying solo: Explaining single-party cabinets under minority presidentialism’, that is currently available in European Journal of Political Research. It is now widely acknowledged that presidents whose parties lack majority support in their assemblies attempt to overcome their minority status by building cross-party alliances. Since the onset of the Third Wave of democratisation, presidents in general, and minority presidents in particular have governed with multi-party cabinet coalitions on a frequent basis. Like prime ministers in parliamentary systems, presidents do this through the formation of cabinet coalitions, defined minimally as the awarding of at least one portfolio to a party other than the nominal party of the president. The preponderance of minority presidents and coalition governments has increased as party systems have become more fragmented. Between 1974 and 2013, on average just over half of all minority presidents in political systems that meet minimum democratic standards have governed with multiparty cabinets. Nonetheless, a large proportion of minority presidents continue to govern with single party cabinets. Whereas 20 per cent of minority prime ministers in parliamentary systems formed their cabinets on a single party basis between 1974 and 2013, unipartisan governments were observed in minority presidential systems almost half of the time (49 per cent). This is puzzling given the many benefits that presidents derive from sharing executive power. Over the last decade, political scientists working almost exclusively on Latin American politics have found for instance that minority presidents who form coalitions increase their legislative productivity (Saiegh 2011) and lower the likelihood of impeachment or removal in times of crisis (Pérez-Liñán 2007). What explains the adoption of single-party cabinets by minority presidents? In our new article, ‘Flying solo: Explaining single-party cabinets under minority presidentialism’, published last month on-line first by the European Journal of Political Research, we explore this puzzle through cross-sectional time-series analysis of all situations of minority presidentialism in both democracies and semidemocracies between 1974 and 2013. Our analysis covers 610 country-years of minority presidential situations, in which we observe a roughly even split between cabinet coalitions and unipartisan government. Hypotheses are tested that relate to the size and distribution of the formateur (presidential) and largest non-formateur parties that make up the legislature; the nature of party linkages and ideological distance between the president and possible partisan allies; and the extent of reactive veto powers held by the president. We show that the decision by minority presidents to ‘fly solo’ – that is, to appoint a cabinet made up exclusively of co-partisans – is a function of four main factors: the size of the president’s own party; the concentration of legislative seats in the hands of one non-formateur party; the degree of particularism in the party system; and the institutional capacity of the president to kill or amend unwanted legislation passed by the assembly. Minority presidents who are close to a majority in the assembly, who face a dominant alternative party on the floor, who coexist with party systems in which particularism predominates over programmatic politics, and who possess strong veto powers are significantly more likely to preside over unipartisan governments. Other factors that have been hypothesised to affect presidential strategies – for example the imminence of presidential elections – are found to have little or no effect on this most fundamental of cabinet choices. All of these findings are robust to the inclusion of regional controls. Of all the factors that we consider in this analysis, the size of the formateur party in the legislature is the strongest stand-alone predictor of single-party cabinets. When all the other variables are held at their means, executives whose parties controlled 49.8 per cent of the seats in the assembly (the maximum value for a minority president under our coding rules) are 47 percentage points more likely to form a unipartisan cabinet than presidents with no legislative co-partisans. We note that this effect takes a linear form: the probability of a non-coalitional outcome increases more or less monotonically in line with the size of the formateur party (see Figure 1). Figure 1. Predicted probabilities of unipartisan cabinets for four key causal variables, at minimum and maximum values with confidence intervals. The dominance of a single party over the bloc of non-formateur parties in the assembly is also found to be highly significant. When all other variables were held at their means, those non-formateur parties that controlled 100 per cent of the non-formateur bloc are 46 percentage points more likely to coexist with single-party governments than when the largest non-formateur party held less than 10 per cent of the seats within the non-presidential contingent. Minority presidents operating within party systems characterised by particularistic linkages are also more likely to have single-party cabinets (18 percentage points more likely) than minority presidents facing programmatic party systems. Finally, minority presidents who command strong veto powers are 46 percentage points more likely to form single-party cabinets than presidents with no veto power, holding all other variables at their means. Therefore, we have moved a bit closer to solving a vexing puzzle about minority presidents. The takeaway message is that presidential authority matters, and it has specific and directional impacts on minority presidents. Their cabinet decisions are affected not only by how close they are to a working majority, but also by the size and salience of prominent nonformateur parties. Presidents whose parties do not control a majority of the assembly are keenly aware of legislative mathematics. These mathematics (i.e. seat distributions) are normally measured by the effective number of parties (Laakso and Taagepera, 1979) or by a Herfindahl fractionalisation index (e.g. Figueiredo et al., 2012).We contend that these aggregate measures are blind to the size and identity of existing political parties, and instead we profile the nonpresidential contingent by measuring the dominance of a single non-formateur party within this bloc. This indicator is far more actor-sensitive than measures of party fragmentation: it captures the relevance of any organised alternative to the party of the incumbent; it can be thought of as a measure of positional rivalry or competition rather than one of dispersion. Simply put, the configuration (as opposed to the fragmentation) of the nonpresidential contingent in the assembly may affect not only the likelihood that invitations to join the cabinet will be issued, but also the probability that these invitations will be accepted. Our analysis also concurs with recent work that places greater importance on the non-cabinet strategies that presidents use to manage particularistic parties (Kellam 2015; Chaisty and Chernykh 2017). This work shows that presidents may desist from using cabinet powers when forming coalitions in particularistic party systems. Hence, presidents who choose to form single-party cabinets may still form multi-party legislative coalitions in other ways. Finally, our analysis suggests that the reactive legislative powers of presidents matter. Far from what is implied in a textbook ‘separation of powers’ model, most directly elected presidents around the world have substantial legislative authority, including the power to veto bills either wholly or partially. In this analysis, we find that those minority presidents with strong reactive vetoes are more likely to form unipartisan governments. Our global, large-N research design trades away some ‘depth’ in return for ‘breadth’. However, the findings here suggest promising avenues of inquiry for presidentialism research in regions where data quality is high and omitted variables can be reinserted (e.g., Latin America), and may help us to establish some parameters for crafting appropriate case study research on the strategic choices of minority presidents. Chaisty, P. & Chernykh, S. (2017). How do minority presidents manage multiparty coalitions? Identifying and analyzing the payoffs to coalition parties in presidential systems. Political Research Quarterly 70(4): 762–777. Figueiredo, A.C., Canello, J. & Vieira, M. (2012). Governos minoritários no presidencialismo latinoamericano: Determinantes institucionais e políticos. Dados 55(4):839–875. Kellam, M. (2015). Parties for hire: How particularistic parties influence presidents’ governing strategies. Party Politics 21(4):515–526. Laakso, M. & Taagepera, R (1979). Effective number of parties: A measure with application to West Europe. Comparative Political Studies 12(1):3–27. Pérez-Liñán, A. (2007). Presidential impeachment and the new political instability in Latin America. New York: Cambridge University Press. Saiegh, S.M. (2011). Ruling by statute: How uncertainty and vote buying shape lawmaking. New York: Cambridge University Press. This entry was posted in Comparative politics, Presidentialism, Semi-presidentialism and tagged minority presidents on May 1, 2018 by Robert Elgie. In a recent post, I linked to a new time-series, cross-sectional dataset on semi-presidentialism. The dataset provides an annual, cross-national coding of semi-presidential countries since 1900. V2.0 is available here. The dataset contains two codings of semi-presidentialism. One conforms to – let’s call it – the standard definition. Here, semi-presidentialism is where the constitution provides for a directly (or popularly) elected president and a prime minister and cabinet that are collectively responsible to the legislature. The other adds another clause. Here, semi-presidentialism is where the constitution provides for a directly (or popularly) elected president and a prime minister and cabinet that are collectively responsible to the legislature other than by a super-majority vote. The second coding was added to V1.0 along with codings for countries that conform to – let’s call them – the standard definitions of premier-presidentialism and president-parliamentarism plus countries that confirm to those definitions with the addition of an equivalent super-majority clause. Where does the need for a coding that includes a super-majority clause come from? I have been aware for some time that Samuels and Shugart (2010, p. 30, fn 4) excluded countries, such as Madagascar, from their list of semi-presidential regimes because of the introduction in the Constitution at a certain time of a super-majority requirement. In fact, they classed Madagascar as presidential for this reason (e.g. ibid. p. 33 and p. 258). Yet, I don’t remember seeing any definition of semi-presidentialism that explicitly includes this clause. Also, as far as I am aware, it isn’t part of any formal definition of the concept that Samuels and Shugart provide and the equivalent clause isn’t included in their (or Shugart and Carey’s) definition of premier-presidentialism or president-parliamentarism. So, it seems to be post-definitional add-on, or an implicit assumption of the formal definition. In one sense, I’m indifferent as to whether a super-majority clause should be included as part of the definition of semi-presidentialism, because even if it is included it still allows for the reliable classification of countries. No expert knowledge is needed to determine whether a country should be classed as semi-presidential or not. We just need to apply certain rules to publicly available constitutional information. This reliability is the most important part of the classification process. Three points, though. First, if it is to be operationalised, then I think the clause should be stated as part of the definition. If it isn’t stated, then for me semi-presidentialism still includes countries with a super-majority requirement. If it is stated, then it obviously excludes them. In other words, we should avoid post-definitional add-ons or implicit definitional assumptions. Second, I think it is still better to class countries with a super-majority requirement as semi-presidential (or as a sub-category of semi-presidentialism) rather as presidential. After all, the constitution does still allow the legislature to bring down the government, whereas under presidentialism, by definition, it does not. Sure, it might take an extraordinary and almost unimaginable set of circumstances for, say, a two-thirds majority to come together and bring a government down, but constitutionally it could happen. (Think how opposing parties can vote together to end a nominally fixed-term legislature). In other words, whether or not it happens is a matter of politics not the constitution. If we are classing countries on the basis of constitutions, which is the only reliable way of doing so, then surely it is better to think of a country with a super-majority clause as being semi-presidential not presidential? The survival of one part of the executive is still not separate from the legislature. Third, a super-majority requirement has implications for the classification of parliamentary regimes too. Maybe there are no examples, but what if there was a super-majority clause in a nominally parliamentary regime? For me, this would still make the country with such a clause parliamentary, although we might want to think about classifying the country as a sub-category of parliamentarism. Whatever the choice, I would be wary of classifying that country as presidential. This is all very nerdy. But why stop there? Next week, I am going to discuss the classificatory implications of introducing other clauses. This entry was posted in Presidentialism and parliamentarism, Semi-presidentialism and tagged parliamentarism, presidentialism, regime types, semi-presidentialism, super-majority on April 25, 2018 by Robert Elgie. In the dataset, pp1 and pp2 code premier-presidentialism as 1 and president-parliamentarism as 2. If a country is not semi-presidential, then the coding is 0. All pp1 codings are based on the definition of semi-presidentialism in sp1. All pp2 codings are based on the definition of semi-presidentialism in sp2. This entry was posted in premier-presidentialism, president-parliamentarism, Semi-presidentialism and tagged Dataset, premier-presidentialism, president-parliamentarism, semi-presidentialism on April 3, 2018 by Robert Elgie. This new dataset provides time-series, cross-sectional data for the presence of semi-presidentialism since 1900. The dataset uses the same country names, country years, and country ids. as the V-Dem data set, allowing them to be easily merged. Semi-presidentialism is defined as the situation where a country’s constitution establishes both a directly (or popularly) elected president and a prime minister and cabinet that are collectively responsible to the legislature (Elgie 2011). It includes cases where a constitution requires a super-majority for the dismissal of the prime minister and cabinet by the legislature. It also includes cases where the legislature’s motion of no-confidence in the prime minister and cabinet immediately triggers a legislative election. It does not include cases where there is only individual prime ministerial responsibility to the legislature (e.g. South Korea), or where the legislature can pass a motion of no-confidence in the prime minister and cabinet, but where the president can ignore it and either keep the prime minister in place or immediately reappoint the same person as prime minister. The presence of semi-presidentialism (sp) is coded as 1, its absence as 0. The start year is the year of the introduction of semi-presidentialism in the constitution if the date is on or before 30 June. If the start date is 1 July or later, then the following year is recorded as the first full year of semi-presidentialism. The end date is recorded for the year that the constitution ceased to be semi-presidential at whatever point in the year it ended. The end of semi-presidentialism is marked by a constitutional change. This can be a constitutional amendment introducing another type of system, or a suspension of the constitution. If there are any mistakes, then please let me know (robert.elgie@dcu.ie). Robert Elgie (2018), Semi-presidentialism – A new country-years dataset [Blog post, 29 March]. Retrieved from http://presidential-power.com/?p=7869. This entry was posted in Semi-presidentialism and tagged Dataset, semi-presidentialism on March 29, 2018 by Robert Elgie.